Finally a recipe shared from my Acme (CSA) box. Tweaked and adjusted of course to suit our tastes but it was definitely a winner according to my carnivore son. He said he could eat meatless dishes as long as they always tasted this good. Just what a mom wants to hear right? 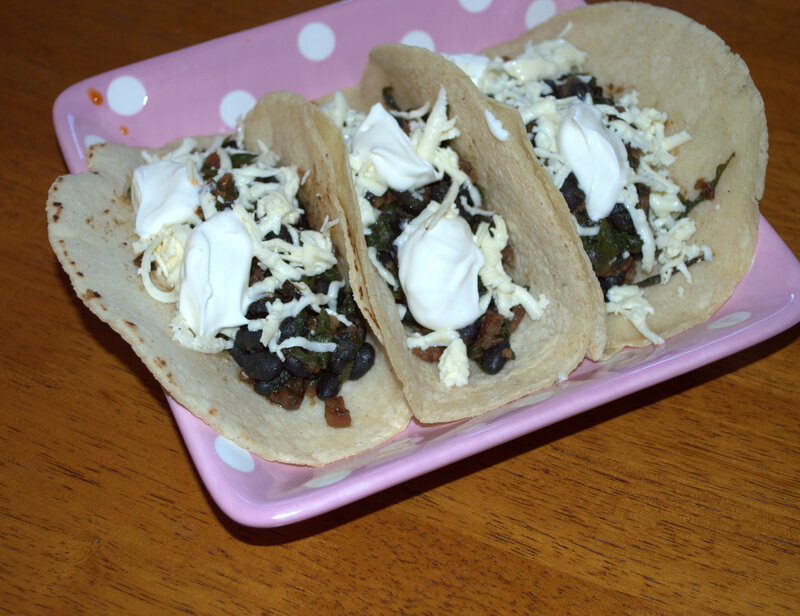 I seriously tweaked the Swiss Chard and Caramelized Onion Taco recipe that came with the the box August 4th. 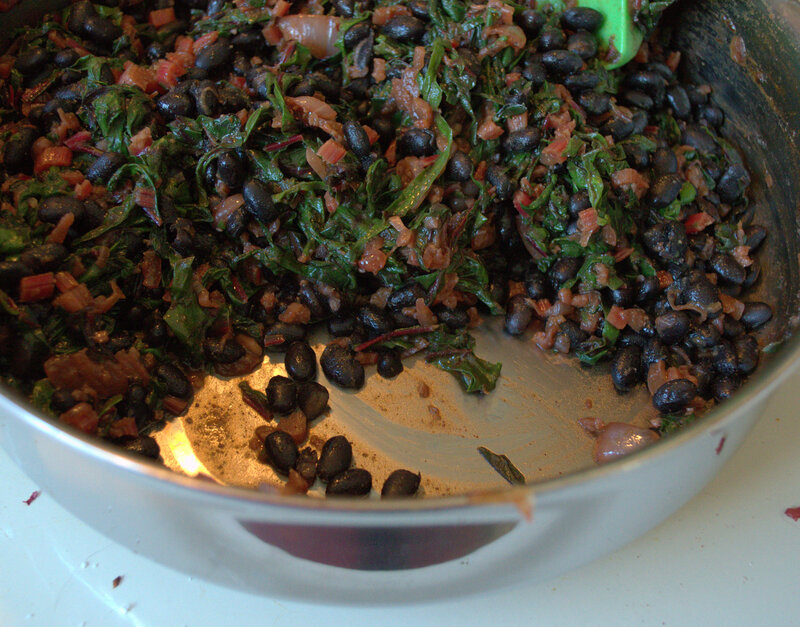 I didn’t think the Swiss chard and onions would be hearty enough for a meal so decided to add some black beans. I only have a couple pounds saved up from previous boxes and figured this was a perfect opportunity to use some of them. Start the beans the night before. If you’ve never dealt with dried beans before it’s not as difficult as you think. You can soak the beans overnight and then cook them the next day or cook them for several hours without soaking. I prefer cooking them without the soak most of the time. I will apologize for the blandness of the pictures. I didn’t have any fresh cilantro to add to the tacos and I think that would have been the perfect finishing touch. Not to mention adding a bit of color to the dish. Remove the stems from chard and finely chop. Slice the chard leaves into thin ribbons. Warm the tortillas. Wrap tortillas in aluminum foil and place in 250 degree oven. Heat 1 tablespoon oil in a skillet over medium high heat. Add the diced chard stems, onion, cumin, chile powder and a pinch of salt. Stir then cover and cook 6-8 minutes until the onions are soft. Remove the cover and cook an additional 4-5 minutes or until the onions begin to brown. Push the onions to the outside of the pan. Add the remaining 1 tablespoon oil to the pan and heat over medium high heat. Add the chard and minced garlic and continue cooking until the leaves are wilted. Add black beans. Adjust seasonings as necessary. 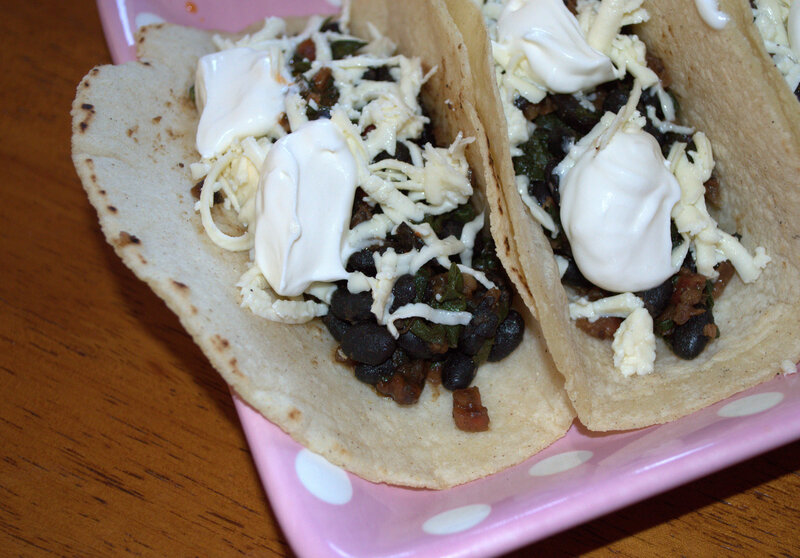 Serve the chard and black bean mixture in warmed tortillas, topped with queso fresco, hot sauce and your favorite taco toppings. To make fresh black beans. Place 2 cups black beans in medium saucepan with 2-3 cups chicken stock (until beans are covered), 1 tsp cumin, 1 tsp salt and bring to boil. Reduce heat to medium and simmer, covered, for 2-3 hours or until beans are softened. I like a nice bite to my beans and not mush. Stir occasionally and add water or stock to beans if they start drying out. I also like to add some chopped onion and minced garlic. Once beans are cooked drain and rinse in cold water. Measure out the amount of beans you want and refrigerate the rest.